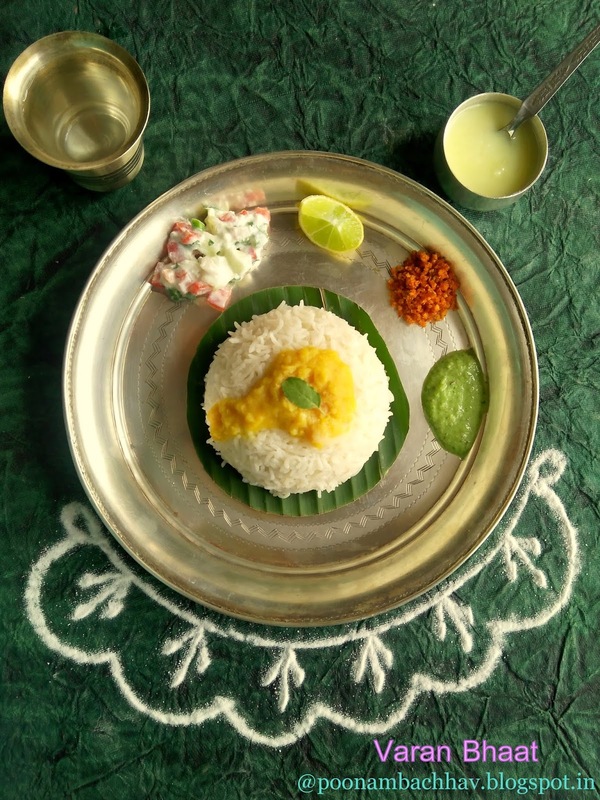 A quintessential Maharashtrian thali will have a serving of varan bhaat for sure. It is a simple homely preparation where in boiled rice is served with a seasoned lentil curry made from arahar or toor dal (split pigeon peas). A dollop of sajuk tup (homemade clarified butter) over the steaming hot varan bhaat with a lemon wedge and some chutney or pickle by the side , is a definition of happiness for a typical Maharashtrian like me. It is a comfort food for us and we have it almost daily. 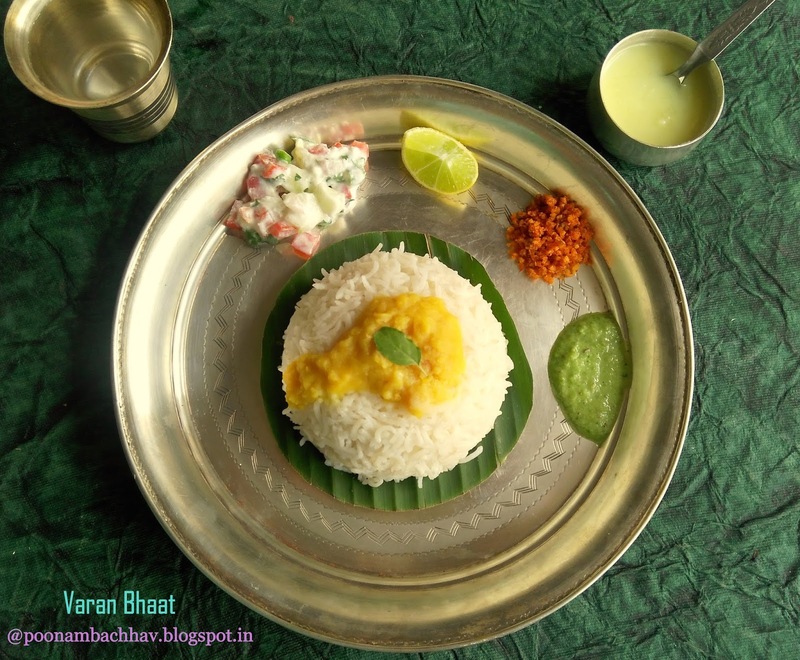 Varan bhaat is a part of wedding menu and no naivedhyam thali (food offering to the God) is complete without it. 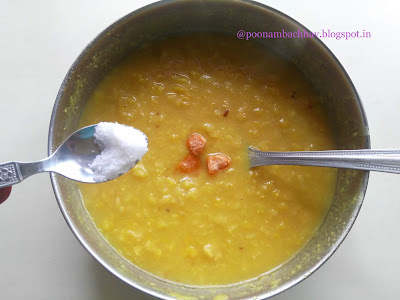 Varan translates to boiled lentil and a traditional Maharashtrian varan made using toor dal is not tempered. It is a simple lentil curry in which boiled dal is seasoned with turmeric, asafoetida, salt and jaggery . 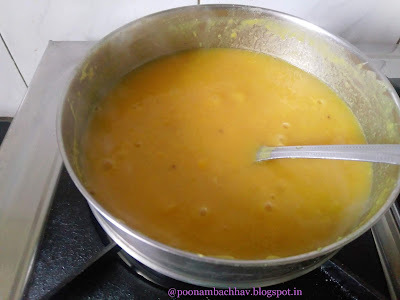 There is also a tempered version of this dal and it is called phodaniche varan. I will share that recipe also soon. Cooking varan bhaat is very easy and and i im sharing this recipe for bachelors and the newbies in cooking. Varan bhaat is also close to my heart for one more reason. This humble yet satiating food happens to be the first dish i ever cooked , at the tender age of 9. I can still recall the memories of that day. It is not that i had never been in kitchen before that,but my role that time was confined to just helping mumma in laying the table for dinner or cleaning the kitchen shelf after the cooking work was done. But i observed my mom keenly while she cooked. That day she was down with fever and my younger brother and sister were so hungry, that they could not wait until papa could arrive from office and order a meal for us. So out of necessity , i decided to step into the kitchen and cook varan bhaat , which was a comfort food for all of us even then. I rinsed the lentil and rice separately and carefully placed them in a pressure cooker in separate containers. The task of closing the pressure cooker lid seemed a bit tricky but somehow i managed that part too . After 3 whistles i simmered the pressure cooker for another 15 minutes and put off the flame. I was confident about the time of cooking, as i had been assigned this job of monitoring the number of whistles and time of cooking , previously . 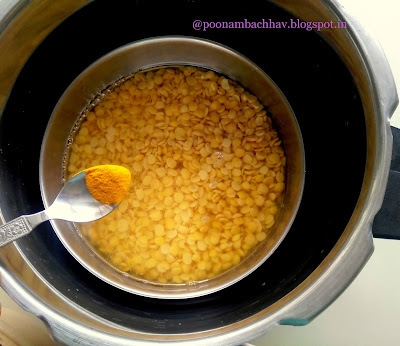 Anyways, i carefully opened the lid of the cooker once all the steam had escaped, whisked the dal , seasoned it with salt and sugar and served the steaming hot waran bhat tup to everyone. My mom and dad were so proud of me and i could see that spark in the eyes of my younger siblings. I know that cooking varan bhaat is not a rocket science and anyone can do that easily, but the way i acted sensibly and with responsibility, was what mattered. Since then i developed deep interest in cooking and watching cookery shows with mumma and experimenting dishes from different cuisines became my favourite pass time. Now you all must be wondering, why am i narrating this story to you ? 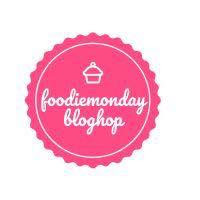 Well ... #MybeginnerRecipe is the theme for our #169th #FoodieMondayBlogHop and we are expected to recreate our first ever food dish we cooked independently by ourselves. This humble varan bhaat is my contribution towards the theme. Take the measured dal and rice in separated containers of the pressure cooker. Rinse under running water until the water runs clear. 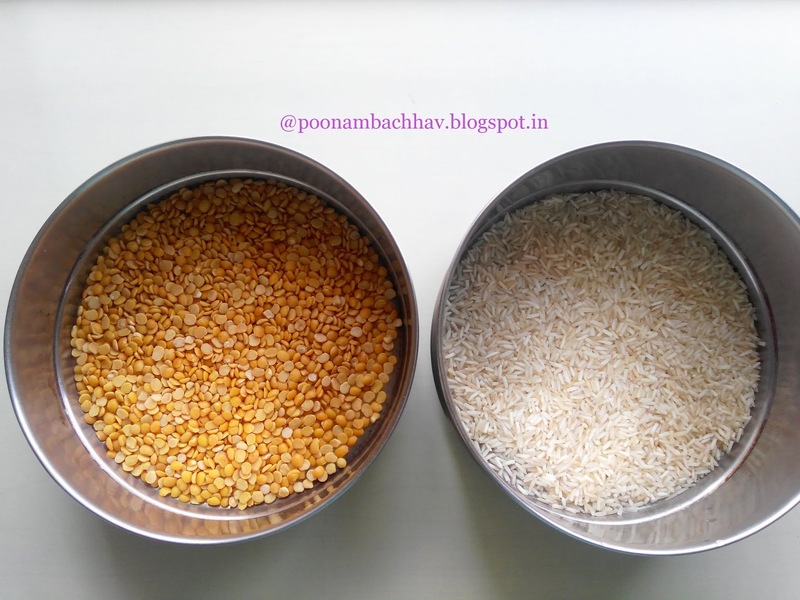 Now add 1 1/2 cup of clean water to the dal and 1 cup of water to the rice. Keep them covered until 30 minutes. 2. 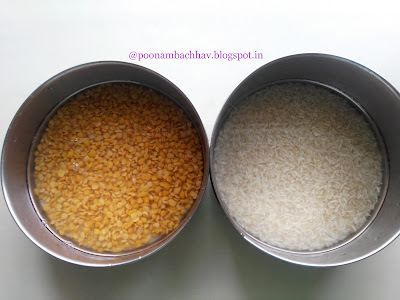 After soaking time, add turmeric and asafoetida to the container with dal and salt to the rice container. Give a quick mix and place them one above the other inside the pressure cooker. I usually keep the dal in the bottom container . Add 2 cups water to the pressure cooker and cover it with the lid. Pressure cook for 3 whistles on medium flame. Now lower the flame and cook or another 15 minutes. Put off the flame and do not open the lid until all the pressure has been released on its own. 3. 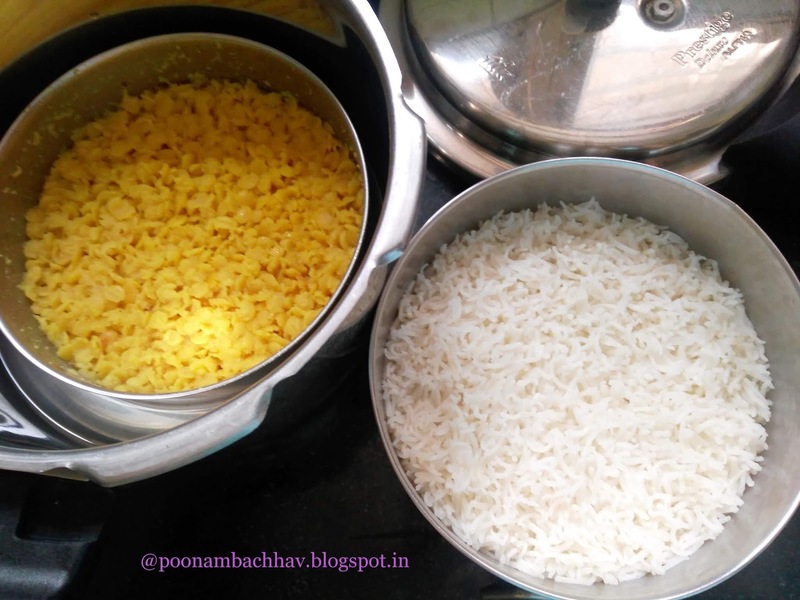 Open the pressure cooker and carefully remove the dal and rice containers. Fluff the rice with a fork and set aside covered, until serving time. Mash the dal with the back of the ladle or whisk it well with a wire whisker until smooth. Add salt and jaggery to taste. If you feel the dal is very thick in consistency, you may add about 1/2 cup of water to the dal. Stir well and tranfer the container to stove top. Allow the dal to cook for another 5 minutes while stirring continuously. Put off the flame . Now to serve, take rice in a greased bowl or mould , press a bit and then invert it on a plate. 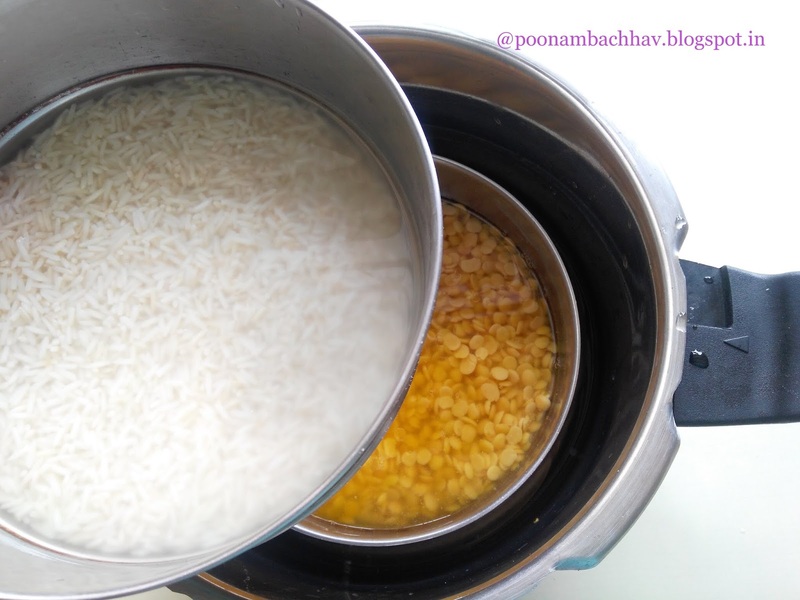 Add cooked dal over the rice and top it with a dollop of ghee. Serve immediately with a lemon wedge and some chutney or pickle by the side. 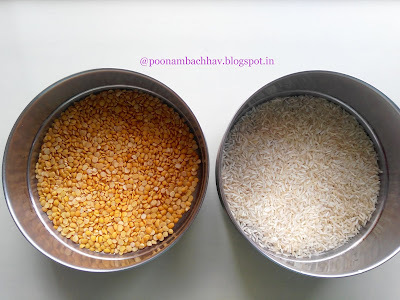 Soaking rice and lentil prior to pressure cooking is not mandatory but it certainly speedens the cooking process thus saving time and gas . You may temper the dal if you wish to but traditionally , it is not tempered. We Maharashtrians add a bit of jaggery in many of our dishes . You may skip if you do not like the sweet taste of dal. Do not skip the generous serving of ghee over varan bhaat if you wish to experience the authentic taste. 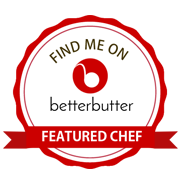 I hope you like the post and some of you would love to give this recipe a try. If you ever try it, feel free to share your feedback with us in the comment section below. 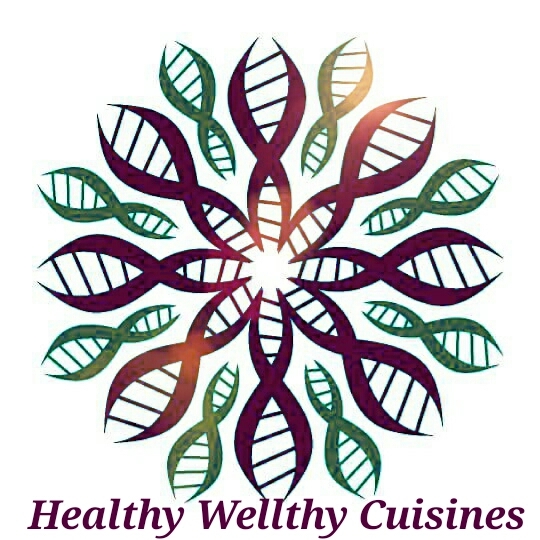 Follow us on #Facebook #Instagram , #Twitter and #Google+ for more recipes and new updates. Thank you Priya. It's often said that happiness is enjoying the simple things in life and i can find no other better example of it , other than this humble varan bhaat tup . I absolutely adore the varan bhaat tup combo with a squeeze of lime and thecha or chutney alongside for the spice. Such a beautiful story of growing up, taking responsibilites and doing your best, showing your siblings that you are there for them. Loved it Poonam. Thank you Vidya. Writing this post bought in many more such childhood memories to cherish at. Loved this post Poonam. Varan bhat sounds really comforting and delicious. 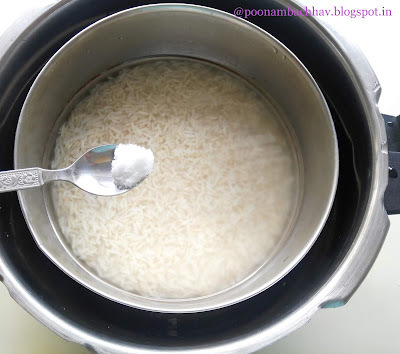 I remember after my marriage I started cooking dal chawal in pressure cooker separater in this way. Dal and rice in two different bowls and some potatoes and eggs in the sides. Beautiful share. The comfort of this dal rice combo is one we all come back home for. I can totally picture you doing this when you were smaller. yes indeed the pressure cooker is an important lesson. Some of the most simplest dishes are the most comforting and satisfying. Making a meal for your siblings at the tender age of 9 was definitely remarkable. I would have probably made jam sandwich and served it with milk :) if ever a situation like that would have occurred when I was 9. Beautiful story Poonam! And 9 is not an age when one can confidently try out a meal without supervision or help! Simple home food is often delicious comfort food. I must try this varan bhat for myself!